Indian Springs Organic Farm's Mike Pasner will be at the Nevada City Farmers Market on Saturday with three large Nevada Irrigation District operation maps showing a high level of detail of NID’s entire district and the proposed Centennial Dam. Mike Pasner of Indian Springs Organic Farm is working with many water users to change Nevada Irrigation District’s policy to reduce Aquatic Herbicides dripped directly into 350 miles of irrigation ditches, which includes 33 miles of natural creeks. There are other viable methods to control weeds and algae. 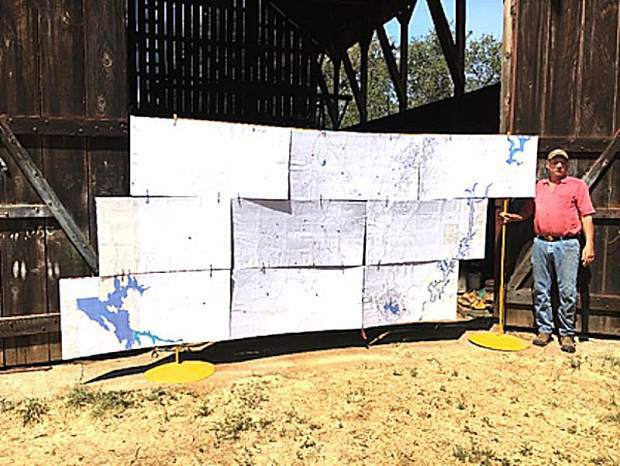 Pasner has created three large NID operations maps (6×12 feet each) depicting a high level of detail of NID’s entire district and the proposed Centennial Dam. These maps will be on display at the Nevada City Farmer’s Market on Saturday. NID will only change its poison dependency if enough people join together in protest. Pasner and others are asking the community to take pictures of NID workers spraying Roundup (carcinogenic Glyphosate) on the ditch banks and berms and of the 65 aluminum drip boxes dripping purple elemental copper, Coutrine, and Nautique herbicides directly into the water. The photos will be used to enhance the map through the addition of imagery of specific sites. Send photos to SafeDitches@gmail.com, and for more information visit “Safe Ditches” on Facebook. Source: Indian Springs Organic Farm.